Deacon Steve Racki and his wife Linda recently moved to East Peoria from Normal. They have been married for 35 years and have four grown children and three grandchildren. They both work for OSF, Linda at OSF Saint Francis Medical Center and Deacon Steve as Pastoral Care Director at OSF St. Clare Home. Deacon Steve and Linda have been involved in marriage preparation programs for the Peoria Diocese for over 25 years. They have participated in Marriage Encounter, Engaged Encounter and Precana. Steve was ordained Deacon in 2007. At St. Patrick of Merna in Bloomington, Deacon Steve and Linda facilitated Scripture Studies, served the Baptismal preparation team, and visited shut-ins and the sick. Deacon Steve taught some classes for RCIA and assisted at liturgical events as well. As Director of Pastoral Care for OSF St. Clare Home, Deacon Steve assists at liturgies, leads the Rosary and conducts Communion Services, scripture studies and book studies. He has been trained in four units of CPE at Advocate BroMenn Medical Center in Normal. 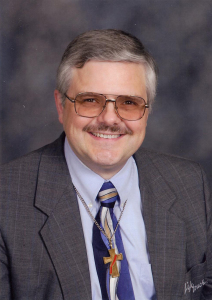 Deacon Steve also has an associate's degree in culinary arts and spent over 30 years in food service management.